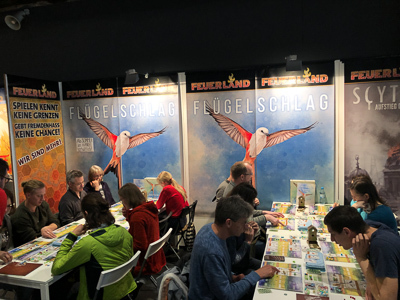 SPIEL DOCH!, 2019 for the second time: The new game fair with the board game releases of the Spring for consumers. That's how the Nostheide Verlag announces the second edition of the fair in Duisburg. 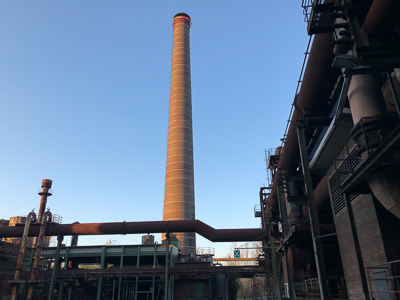 Once again it`s playing time in the old factory hall in one of Germany's biggest industrial areas of the last century. 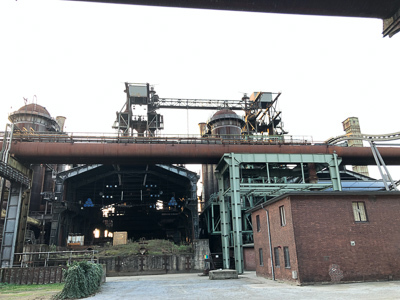 Where once have been a world of coal and steel, there is now a landscape park with many cultural offers and various sport facilities. 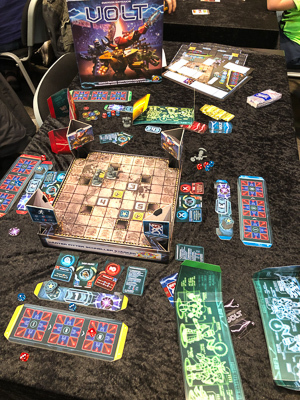 Some say that boardgames are also a kind of sport, so a boardgame convention seems to fit to this place. 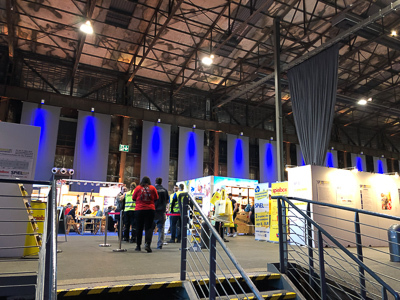 And last year the first edition of the fair was already a huge success according to the Nostheide Verlag, the organizer of the event. As last year the first day of the convention begun for me in the office of my main job, and I was not able to leave that place before 2 o'clock. On Fridays that's not really the best time to get home, still less to drive to the SPIEL DOCH! 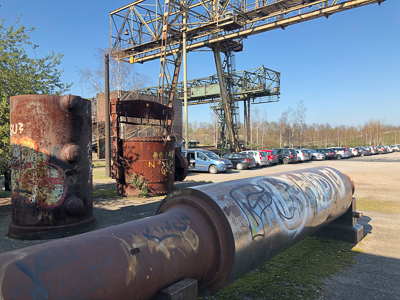 As a result it took me about 90 minutes to master the approximately 25 km to Duisburg, and there was not really much time to play many games together. The weather, however, was beautiful, so I took some pictures before entering the hall of the convention. As you can guess a lot of people enjoyed the good weather in the open. Good for me, so the booths inside the hall were already less crowded. I was told that this morning a lot of school classes visited SPIEL DOCH!, and it was a little bit crazy to explain and play games. But now, most of the staff were relaxed again and were free to explain their games to me. And this was badly needed, because I was on my own, and needed fellow players to beat. 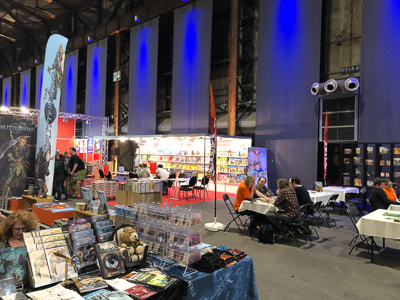 From one of the biggest German publishers to one of the smallest: next stop for me was at the booth of TETRAHEDRON-GAMES. This is a young publisher with roots in Nuremberg. 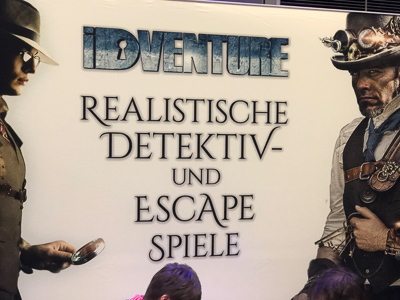 Although the publisher only exist since 2017, they already have published their third game. 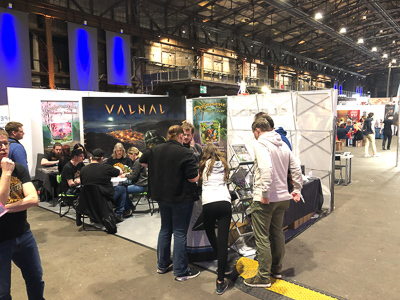 While their first game Valhal is a strategic game in which players build up various projects in the Viking times with many random events, the two other games are short card games. 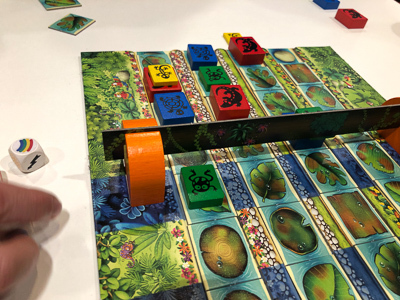 Dodoresque - Jungle Fever and Dodoresque - Cherry Blossom have the same core mechanism and can be combined, but they are still independent games. 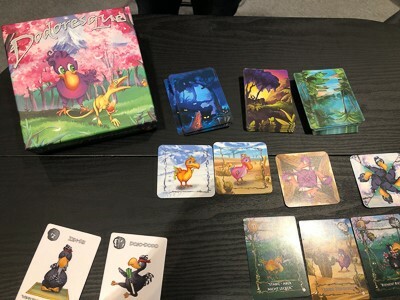 In both games each player takes one Dodo and three cards, before he tries to build a nest for her or his Dodo. To do so, new cards are drawn from three different card stacks. It is the players' aim to get good nest building materials, but for that they must have the right action cards first. And the Dodos can be hit and must be protected too. The cards have beautifully artwork, and a lot of the cards are unique. Although the game seems to be mostly luck-orientated, I would guess that it is a funny card game you cannot only play with your children. While I still was listening to the rules of Dodoresque, I spotted the booth of HAL-13 on the other side of the hall. 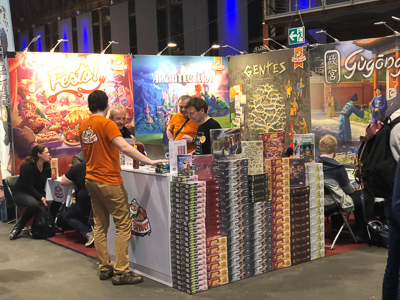 The booth looked nearly the same as last year, and when I went over, I also so why: Rogue Marechal is still promoting his interesting card game Serengeti: A Race for Life. I already wrote a complete review for this game, so maybe you wanna check this in our boardgame section. 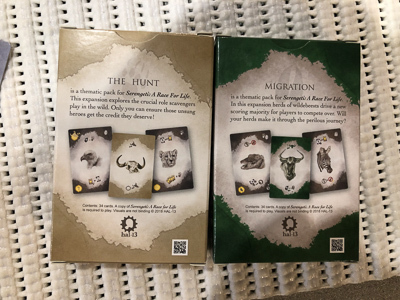 But Rogue also was presenting something new: two expansions for the core game, called The Hunt and Migration. Both expansions let you exchange some of the animals of the base game to create a new game experience. 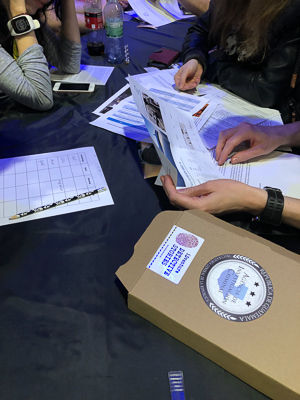 While the Hunt explores the crucial role of scavengers and make the game more aggressive, Migration introduces new scoring mechanisms. Especially the latter expansion was extremely difficult to design (or better balance), Rogue told me. Rogue also revealed that he plans at least two more expansions, but even more important: he tries to find a cooperation, before he starts a new projects. I wish him good luck for that, because I still think that Serengeti: A Race for Life is a great debut with many options. One genre in the boardgame world I still haven't played yet is the murder mystery dinner. But at every convention I stop at least at one booth to have a closer look on this type of games. 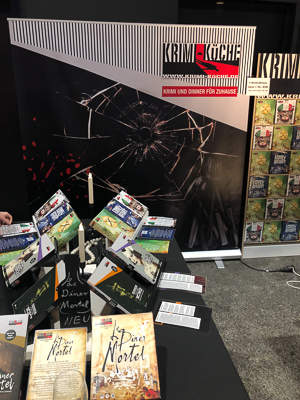 Here in Duisburg it was the booth of Krimi Kueche who have mystery dinners for 6 to 8 players without the need of a master. All games are played over 4 rounds. 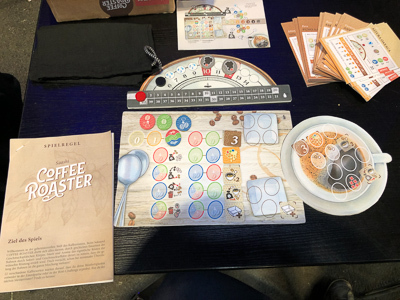 Maybe I will make it this year, but the convention is definitely not the right place to test the game. So I just took a picture for you and kept on moving, while more and more visitors left the hall for today. OK, one more booth and one more game for today. 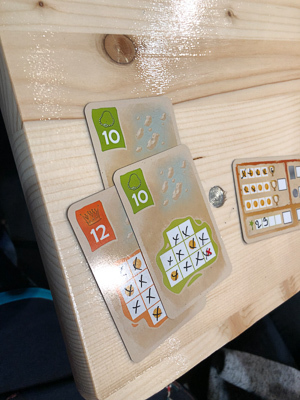 I want to conclude with Silver & Gold from NSV (Nürnberger-Spielkarten-Verlag). The game was shipped to the publisher only yesterday, so that's something dew-fresh to end the day. 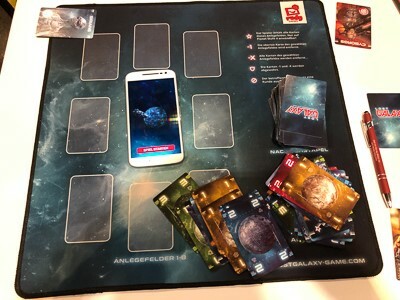 As usual for the German publisher, the new game is a card game. But unless most other games, it comes with felt pens. At set-up every player draws a treasure map that must be filled with crosses. Those treasure maps have different patterns, so no player will have the same map as an opponent. Then, every round a new tetris-like card is drawn and every player can then mark the shape of the pattern on his map. Only if a map is filled with crosses, it contributes to the players victory points. Of course, there are also a lot of bonus points in the game... After The Game and The Mind NSV once again presents a promising small card game with high potential. Of course, the theme is not the most innovative. I mean, there are quite a lot of tetris games in the world. But NSV always knows how to eliminate all clutter and strip the games to its main mechanism. I think this is really great and it always worth to try out. 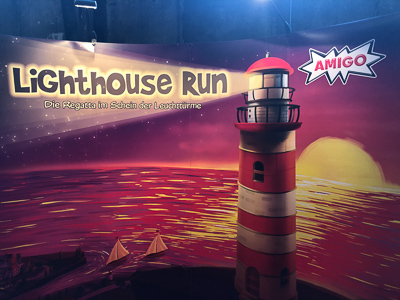 As we both came with the children, the first game for today was a family game at the booth of AMIGO. In Lighthouse Run everyone of us got a set of 5 sailboats that we had to manoveur along the coast in the safe harbour, everybody following the same road. It's time to hurry, because a storm is coming up and once the storm reaches the ships, they have to stop where they are (they go ashore and aren't destroyed, hey, it's a family game!). But they also only get as many victory points as the last passed lighthouse along the coast. And the lighthouses have another important function in the game. Only when they are turned on, it is possible to move a boat in the corresponding sector. Unfortunately only three of the six lighthouses are turned on at the same time, and so we had not only to master the storm, we also had to manage the lighthouses. All this is done with a single card that you have to play in your turn. On the one hand the card determines the lighthouse you have to turn on, on the other hand it shows the number of boats you can move as well as the number of steps you can move the ships (at least when the sector's lighthouse is turned on). As you can imagine, the further you sail with your ships the more victory points you will earn. 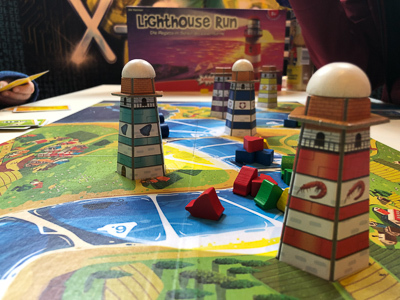 A very light game, but perfect for the children, with great artwork and a funny game in game (the turning on of the lighthouses). Really an excellent family start for today. 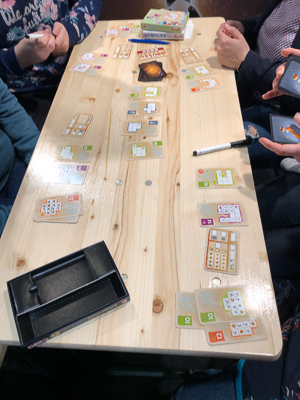 QUEEN GAMES was not the only booth with fully occupied tables. Indeed, today the hall was much more crowded than on Friday. But still it was possible to find the one or other free table (at least if you were not focused on just a few special games) and find someone who could explain the games. For example, we found a table at DLP GAMES where we were introduced to last year's card game Moorea. Soon after, everyone of us was equipped with 6 resource cards. As the game plays in the South Seas, the resources are clay, shells, bamboo, wood and other base materials. On our turns we could use the hand cards to acquire new product cards. Those new cards are either stronger materials or better products you can use to aquire even stronger product cards. Those new products are again taken on your hand. On the other hand, there are also final products that are layed out in front of the players. These cards are the victory points and some of them have also other useful functions, e.g. expanding your player hand or acting as some kind of trade market. The game turned out to be a little bit a deck building and a little bit a collection game. It run quite smoothly and was even playable with the children (although I doubt they had a strategy). I would think that the game would also serve as a short filler game. I personally was missing a little bit the aggressive parts. Apart from snatching cards away from your opponents, there is not really a way to attack your opponents. But as this is only personal (I bet my wife won't miss that) and because the artwork is nice and colourful I would like to play the game a second (and maybe much more) time(s). 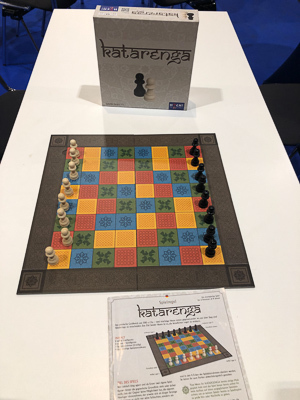 The first game I want to talk about is Katarenga from HUCH!. As you can see in the pictures, there are only the same - pawn like - game pieces. But still these game pieces can use all the moves from the different pieces of the original chess. How does that work? Well, it's very simple: you can see in the pictures that the board is very colourful with each colour also having an individual pattern. 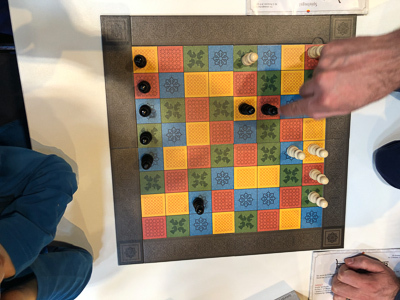 In the game, the colour (or better the pattern) of the space the game piece begins its move, determines its movement rules for the turn. 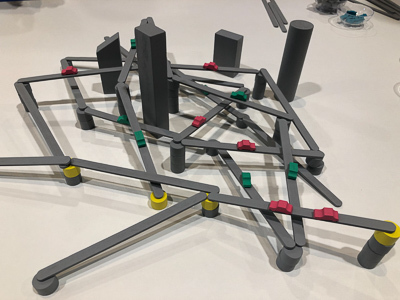 So the same game piece can move like a tower in the one round and move like the King in the next (if it ends its movement on a space with the pattern of the King piece). 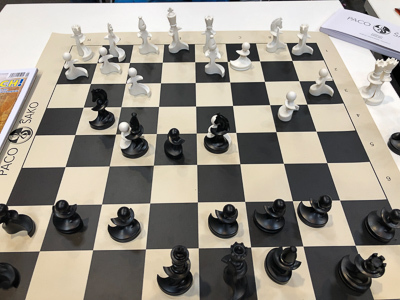 It's the players' aim to reach the front line of the opponent with two pawns (and stay there for one more round without being beaten). A lot of rethinking is demanded if you are familiar with the traditional chess. But it's a great challenge. Also I think it's a great new way to learn the chess rules, really an interesting modification of chess. 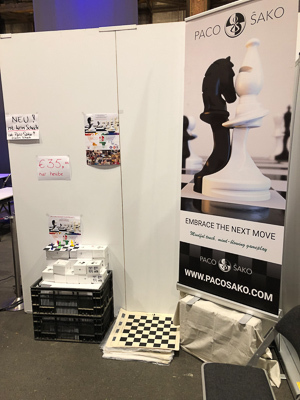 Paco Sako is the other variant of chess I want to talk about. At a first glance, this game has much more in common with the original chess. You can see that all game pieces are pretty much the same. And there is the same board, too. Moreover, the chess pieces also move the same way as in traditional chess. But there is no beating. 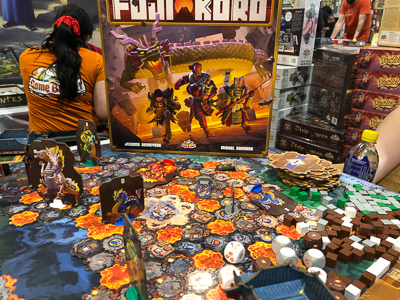 You can see that all game pieces are arched, and if you have a closer look you can also see that two figures fit together, so that they form a union. And that's exactly what's happening. Instead of taking each other's pieces, a union is formed. 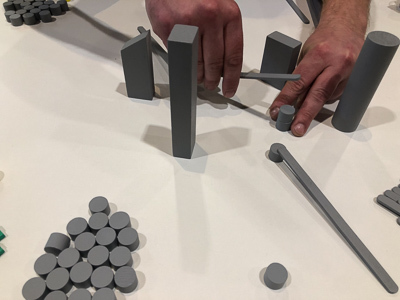 From that moment a player can move this union with the normal movement rules of his piece, but she or he takes the other player's game piece along. Of course, you can also leave a union again, but you must first take over the union by another game piece. The freed game piece can immediately move according to its movement rules, e.g. to take over another union. By this, you can even start a chain reaction. The game was created by the author to be an expression of peace, friendship and collaboration (that's why there is no beating). But it's also a wonderful new way to experience the chess game. 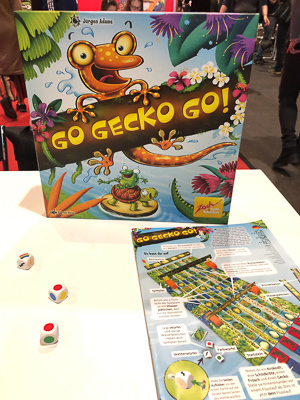 I was told, that in Netherlands the game has already "entered" many school classes. By the way, it's the players' aim to create a union with the King of the other player, that's called putting him in Paco Sako. So, that's it from SPIEL DOCH! 2019. The fair once again was a great success according to the organizer. 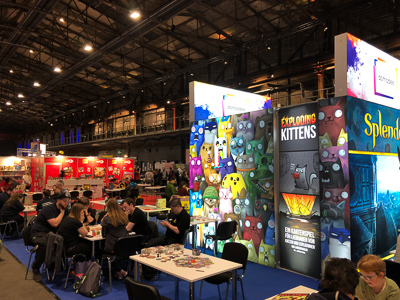 Nearly 100 publishers presented new (and older) games. 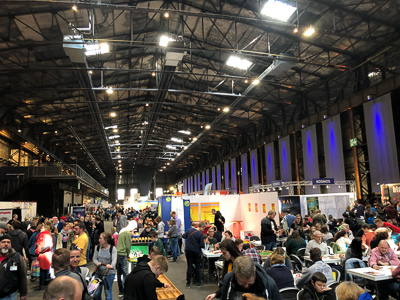 And over 14.000 visitors (a plus of 24%) came and played many, many games in the last three days. Of course, the fair will be back in the next year again. Stay tuned and come back to our website, there are still many games to be discovered in the next couple of months. 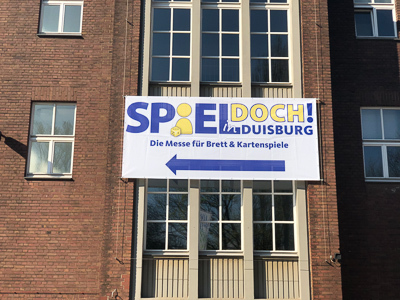 SPIEL DOCH: A new convention in Duisburg. The "SPIEL 97": My report on the 1997 convention. The "SPIEL 98": Images, stories and more from Essen '98. For the first time with daily updates! 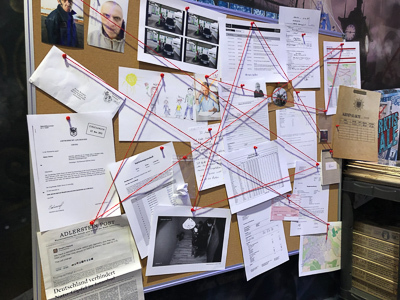 The "SPIEL 99": The missing year! I was studying in Newcastle and missed the SPIEL. 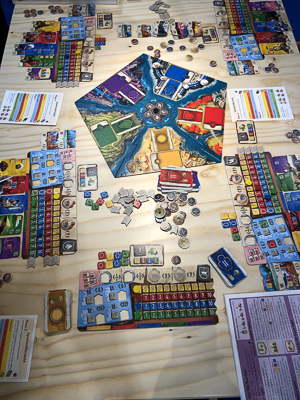 The "SPIEL 00": Once again, you will get daily reports from the SPIEL in Essen ! The "SPIEL 02": Bejing city traffic and late planes. I barely made it to the SPIEL in 2002. The "SPIEL 03": No excuses in 2003! Full coverage on all convention days. 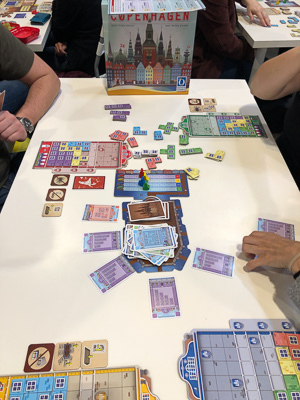 The "SPIEL 04": A shortened stay at Essen, but still all essential coverage. 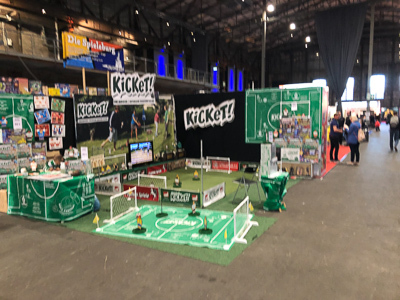 The "SPIEL 05": Back at home! Once again living 500 meters from the convention. 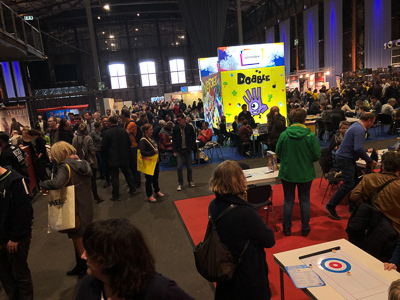 The "SPIEL 06": Still growing! An even longer report from all convention days. The "SPIEL 07": Meeting lots of friends at the SPIEL 2007. 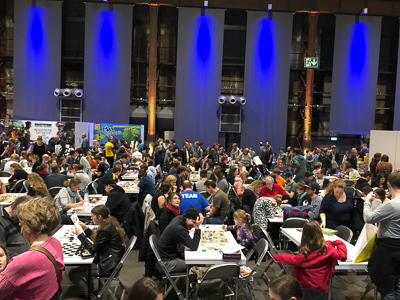 The "SPIEL 08": Bigger than ever! 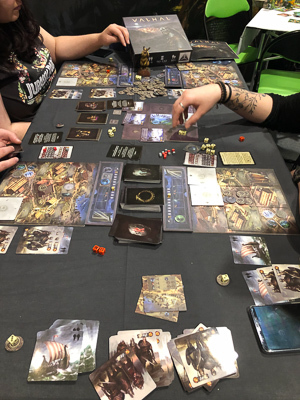 The "SPIEL 09": One convention to rule them all! 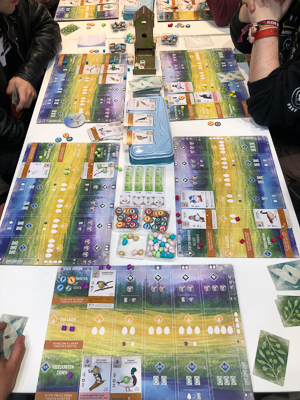 The "SPIEL 10": The Polish landslide! 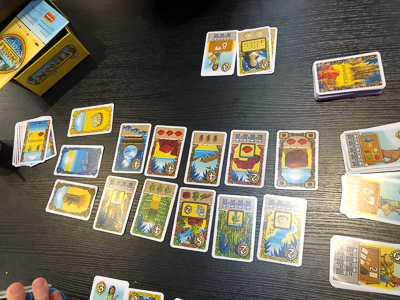 The "SPIEL 11": 7 Wonders - but only one SPIEL! The "SPIEL 12": Beware of The Maya Calendar - the last SPIEL before Armageddon? 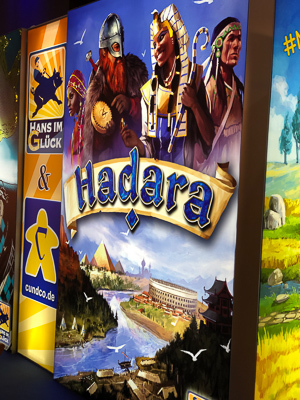 The "SPIEL 13": New halls - same show? 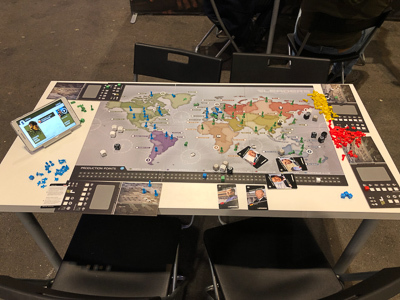 The "SPIEL 14": The dicerollers strike back! 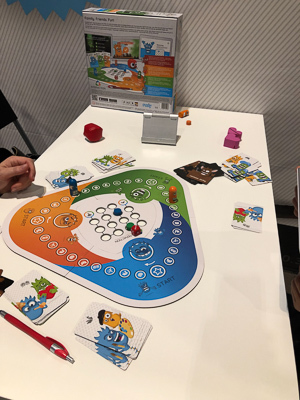 The "SPIEL 15": M.U.L.E.s in sight!!! 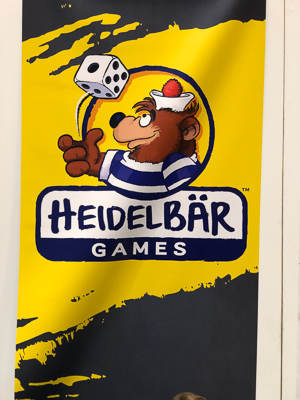 The "SPIEL 16": The Gamebox celebrates its 20th Anniversary!!! 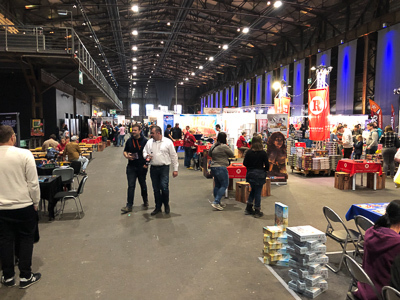 The "SPIEL 17": Shift change at the Gamebox!